Emma Lucas presents her project covering the history of the AEP buyout of the Village of Cheshire at the Smithsonian Museum while competing in National History Day. WASHINGTON D.C. — Emma Lucas, a seventh grader from River Valley Middle School recently competed at the national level for National History Day. Last fall, Lucas began working on a project for her school’s academic fair. 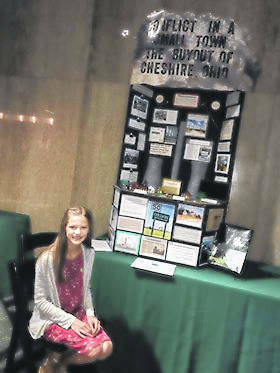 Her grandfather, Scotty Lucas, was a lifelong resident of Cheshire and former mayor so she chose to focus her project on the historical significance of the AEP buyout of the Village of Cheshire, which fit into the competition theme of conflict and resolution. After competing at the regional and the state level, where she brought home first place, Emma earned the right to compete at the National History Day in Washington D.C..
Emma presented and was judged on Monday, however she did not place as a finalist. She was given feedback from the judges which was universally positive, according to family. Of the 4,000 students presenting at National History Day, she competed against over 100 in her category. When speaking about the competition judging and interviews, Emma felt confident, albeit nervous. Emma’s favorite part of the trip was being asked to present at the Smithsonian Museum in Washington D.C.. She spent all day Wednesday presenting her project and interacting with visitors to the Smithsonian. “I really liked meeting new people. I traded pins will all kinds of people too. I met a lot of new friends from all over the country. I met a girl from Korea that was exchanging pins and stuff,” said Emma. While Lucas didn’t place at National History Day, she hopes to return next year with an even better project. The theme for next year is “Tragedy and Triumph,” and she is already looking for new local ideas.